It’s a bit of a haul from our house to the new (well, new to me) Ikea in Centennial, Colorado – just under 90 minutes. But hey, that’s better than a 9-hour drive to Salt Lake City, Utah. I think of Ikea as the OCD adult amusement park. They even provide sofas, beds, and a restaurant because you’re basically going to be there long enough for your body to require sustenance and rest as you try to find your way out of the store. If it sounds like I hate Ikea, I do not. It’s just that I am occasionally distracted from our seek and destroy shopping mission. Jeremy will have to come and fetch me from the children’s section or he’ll find me standing mesmerized in front of the colorful lamps and lights. And if the “we’re only going to be there for an hour or two”-trip-turned-7-hour-adventure wasn’t enough, you get to spend as much time assembling everything when you get home. But now we have clever Swedish storage for all of our junk! Mmmm noodles. I am a noodle girl. Every now and again I’ll wonder if I’m a rice girl, but no – I am true to the noodle. That doesn’t mean I don’t enjoy my rice. 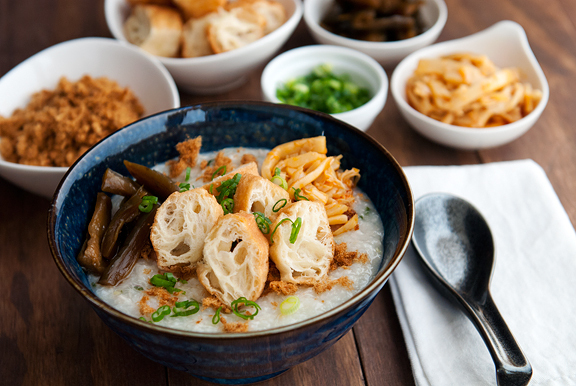 Now that we’re acting like winter again, it’s the perfect time to be making congee, jook, or xi fan – Chinese rice porridge. I like my mom’s chicken congee. My parents used to make congee on the weekends for breakfast when I was growing up. It is a savory porridge which might explain why I have never been a huge fan of sweet breakfasts. In college, I’d make the basic rice porridge when I wasn’t feeling well because it was neutral and settled my stomach. 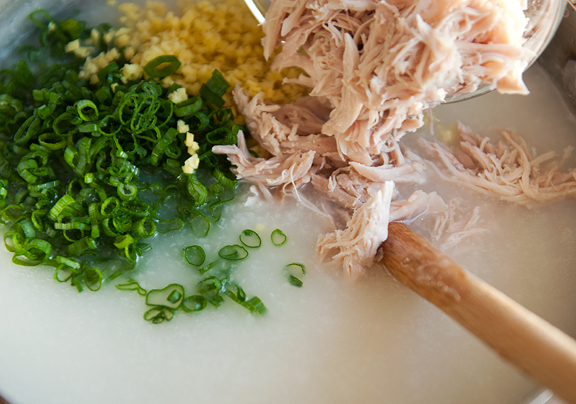 These days I make my mom’s chicken congee because I love the ginger. I called them up last week to verify the recipe in my head with the recipe in their heads. Mom is so cute when I tell her I have a question about a recipe. She’s eager to help out and to make sure I do it right. Thing is, when they see that it’s me calling, they put me on speaker phone. So as soon as Mom starts to share her method, Dad butts in and says, “Let me tell you how to do it the right way…” See, Dad is just as eager to explain how he does it. It happens practically every time and I try my hardest not to laugh, but it’s really entertaining and a little insane to get a recipe from them. Most of my recipes are a marriage of the two versions and I think that’s a good thing. Whenever I eat these family foods, I feel a little tug in my heart. Use short grain rice. Sushi rice is fine. Don’t use sweet rice – my dad shouted that warning. I asked if you can use leftover cooked rice and my parents were dubious. Yes, you can, but it’s inferior. You can use canned chicken broth, but if you have homemade chicken broth on hand, go with that. My homemade chicken broth is just water, chicken, and salt added at the end. I don’t want the aromatics of a mirepoix (onions, carrots, celery) in this chicken broth. It’s a quick 30 minutes in a pressure cooker or you can make the broth on the stove top in 2-3 hours, basically until the chicken is falling off the bone. 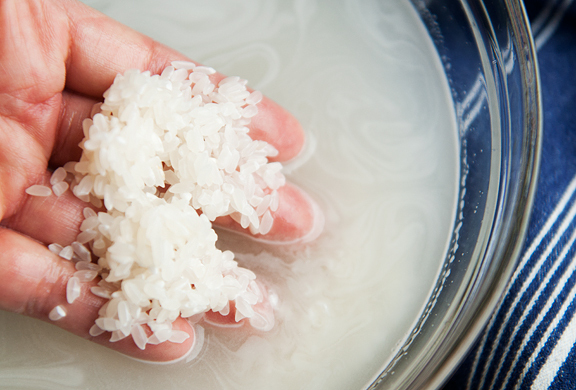 Meanwhile, 4-5 cups of water for every cup of rice should be simmering together for a couple of hours, adding water (or broth) as it thickens until the grains are fat and soft. 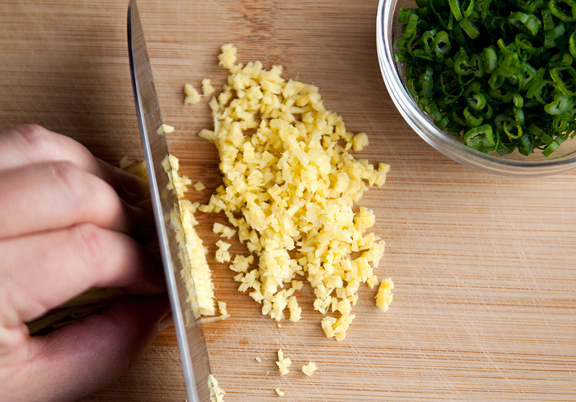 Depending on how mellow or sharp you want the ginger to be, you can add it earlier or later in the cooking process. Mom likes ginger, so she adds it in late. I like ginger too. 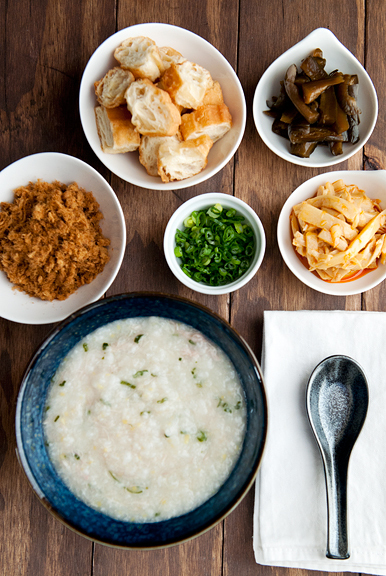 The final congee will depend on your preferences. If you want it soupy, add more broth. If you like it thick, let more of the liquid simmer off. Dad said running it through a blender gives it a nice smooth texture (some restaurant told him that was the secret to their awesome congee), but I prefer some texture. When it’s done, finish it off with a tiny dash of Chinese sesame oil and stir it in. I keep the sesame oil on the light side. Okay, but it’s really all about the add ins! For me, pork sung or dried shredded pork or pork floss (ro song), chili radishes (la luo bo), and pickled cucumbers (not dill pickles, a salty and sweet Chinese pickled cucumber) are a must have. Other goodies include more green onions, Chinese doughnuts (yo tiao), chili bamboo shoots, and thousand year old eggs (pi dan). Add a bit of this and that to your congee, mix it in, and soon you will have a warm and happy belly! savory breakfast for the win! Wash the rice under cold water. I typically give it 2-3 rinses. 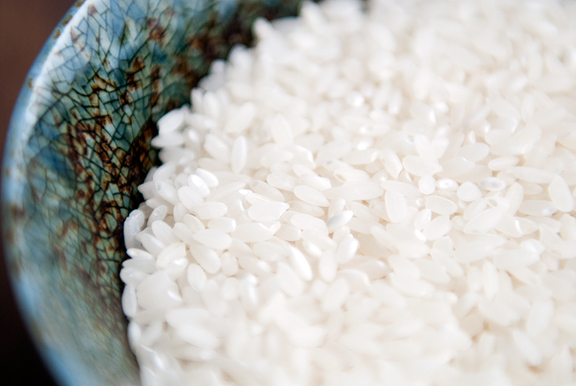 Place the rice and 5 cups of water in a medium saucepan and bring to a boil. 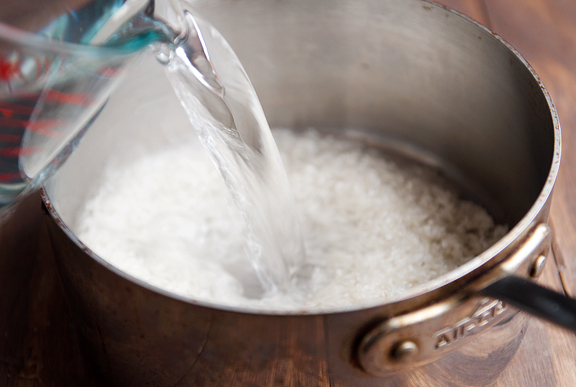 Reduce the heat to a simmer, occasionally stirring the rice so it isn’t sticking to the bottom of the pan. 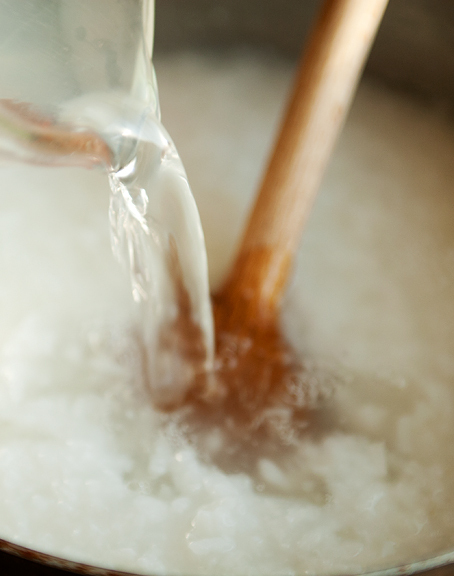 Stir in more water (or broth) as necessary if the congee starts to get too thick, about a cup at a time. Turn the heat to high, bring it to a boil, and reduce to a simmer. Continue this until the rice is practically disintegrating and very soft (about 2 hours). If you prefer a mellower ginger flavor, add the ginger when the congee is not quite done. 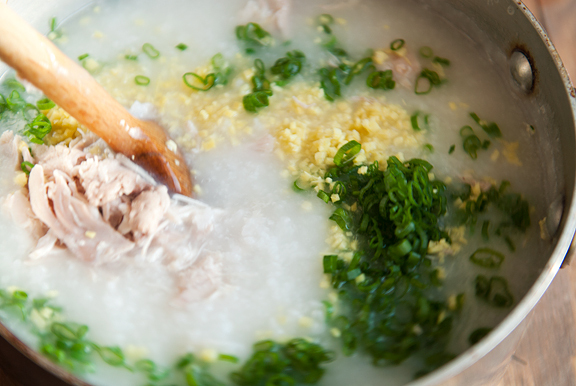 When the congee is the right doneness, add more broth to achieve a soupy consistency or continue to simmer to desired thickness. [Optional: You can run the congee through a blender (please be careful as hot congee can explode from the blender) for a super smooth texture.] If you like a stronger ginger flavor, add the ginger now. Stir in the green onions and shredded chicken. Salt to taste (don’t use soy sauce). Stir in a dash of sesame oil. Serve hot with sliced Chinese doughnuts, chili radishes, chili bamboo shoots, Chinese pickled cucumbers, pork sung, green onions, thousand year old eggs, or any other add-ins. Serves 4. 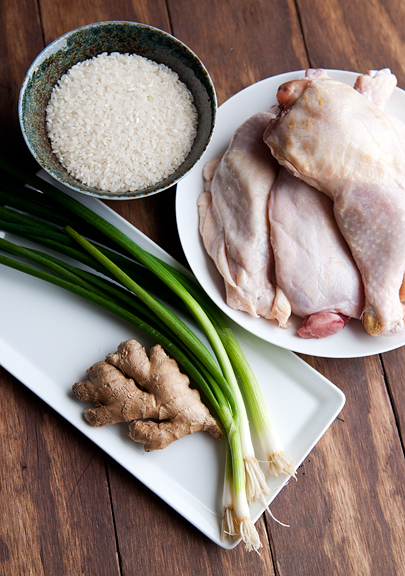 Chicken: Store-bought broth and chicken meat are fine to use, but I prefer making my own. Here’s how I do it. 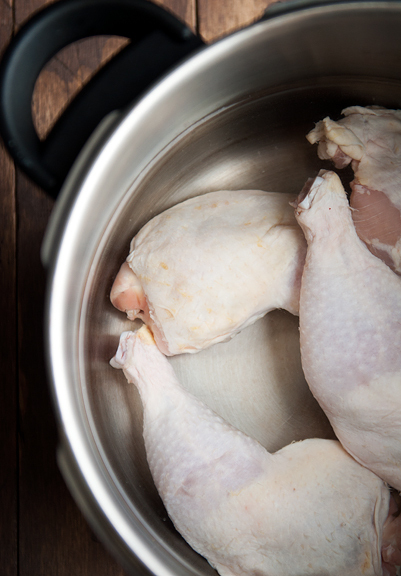 I place 2 pounds of chicken (with bone) in a pot with about 2 quarts of water. In my pressure cooker, I set this on high for 20 minutes and let it cool on natural release (about 15 minutes). On the stove top, I bring the pot to a boil and reduce to a good simmer, half covered, and cook until the chicken is literally falling off the bone (close to 3 hours). I defat my chicken broth and add salt to taste. 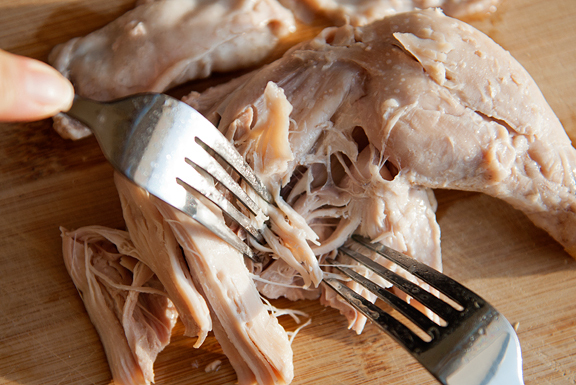 I remove the skin, bones, cartilage, and fat from the chicken and shred the remaining meat with two forks. Oh Ikea…how I wish we had one! The story about your parents is so sweet. I have no role model for that, but will strive for it anyway. I guess I’d better get my husband to help me cook more, so he can chime in when we’re helping the kids out later! Congee rocks. Small bits of kimchi are awesome in it as well. I would eat this for breakfast every morning if I weren’t so lazy. Love your blog, Jen. I’ve been making a bit of congee of late…it’s hot, filling, delicious, and cheap. I cheat on the broth though. We have a similar recipe called Kanji (from Kerala- a southwestern state in India) which is essentially the same- rice boiled until mushy/soupy. Total comfort food and the add-ins make alllll the difference in the world. Love this comforting meal. Gorgeous photos! 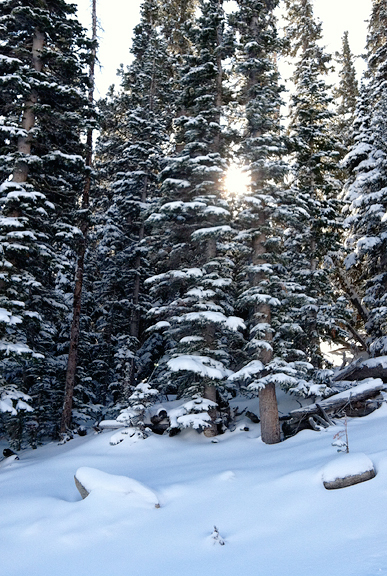 We finally got some snow this weekend, it’s been a dry winter so far. That is a great meal for a snowy day! I love IKEA! My husband and I would take the 3 hour drive down to SLC just for an ikea run! Now that we’ve moved, we have one about 45 minutes away and I’ll be visiting soon. Making my list and checking it twice! We have the same phone ritual in our family too! My sister and I finally learned to assume that we’re on speakerphone when we call our parents, but it was an awkward learning curve. When we’re all together for special occasions and someone calls in, my parents will plunk the phone in the middle of the table and we all giggle knowing that the caller has no idea he/she is talking to a room full of people. You write so beautifully about the memories and emotions that childhood foods evoke. I feel that same melancholy tug on my heart. Just over Christmas break I had an upset stomach and my Mom made me a bowl of jook. And I’m almost 50. Happy 2012 to you, Jeremy, and Kaweah! I love, love, love congee! My family used to make it every Sunday morning for brunch. I need to bring this tradition into my house. Maybe I’ll make it this upcoming weekend! I love your stories about your parents! I’ve been meaning to try congee in an authentic way–I’ve seen some crazy fancy-pants varieties. I’ll be making this! I watched one of my close friends make a giant pot of congee for her family for the week (I guess it reheats well?) and it smelled so good! She added sliced thousand year eggs to it and I like to add a bit of soy sauce to mine at the end. Nothing like it when it’s cold outside and I love the addition of chicken, makes it good for dinner too. And I loved your story about your parents, mine always put the phone on speaker too and then talk over eachother. I’ve been looking for a good congee recipe, and yours is it. Thanks. Congee is easily my favorite comfort food. I used to be a congee hater until I got braces and soon became a convert. I still need to acquire some broth making skillz from my mom and will try using a pressure cooker sometime soon. That is such a gorgeous-looking bowl of congee. And adding Chinese fried dough plus all the fixings definitely completes the congee. Oh this post made me miss my mom so much. She is an amazing cook and one of my favorite dishes is the congee that she makes with delicious shrimp balls. Must call her now. Thanks for the recipe. I made a semi-Japanese version for my mom when she had gut problems from chemo or when my innards are unsettled. It really is like chicken soup! Hi, Jen. Can this be made with brown rice? I can’t have much white rice because of having Type II Diabetes. I love the sound of the recipe. It’s like no congee I’ve ever read about, where it’s always sounded like a thin gruel, not a luscious flavour-laden porridge. Nice sunrise photo, and I’m glad to see you finally got snow! 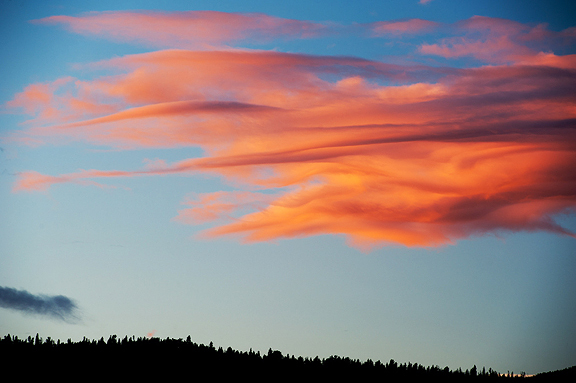 We are still dry here in the Sierra. I HEART congee. I live north of 60 and can’t get good Chinese food, let alone a good bowl of congee, very easily. Any chance you have a good Chinese doughnut recipe to share too? Really like your posts. Thanks for them. This would definitely warm up the tummy for a cold winters day. Looks absolutely YUMMY! I love congee! Total comfort food. 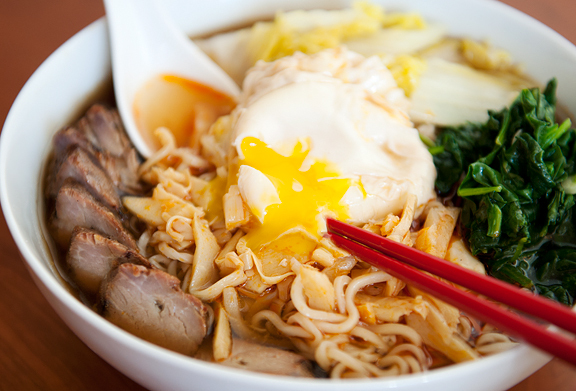 Your ramen looks awesome, though. Looks like a Momofuku recipe? Where do you get the noodles? the title of your post = WIN. Totally comfort food!! I do have to have fried salted peanuts to go with it. Another suggestion, which I believe is more Malaysian than Chinese, is fried minced garlic. It is the perfect topping for congee, soup or hotpot. Mince up a few cloves of garlic, put into a bowl with some oil, microwave for a minute or so. Caution that it stays hot and will continue to cook out of the microwave. You want the garlic to turn golden brown and crispy. That just looks beyond amazing. I love mushy rice and all those types of foods so I’ll have to try it one day. Susanne – oooh, that sounds spectacular! I love spicy!! Bing Chou – it’s okay. I do it too. Binsy – yes, I think nearly every culture has some sort of mushy porridge comfort food. It’s awesome the different kinds that exist! Melissa – wow, 45 min? That is pretty sweet. Jean – Chinese families are a riot, aren’t they? That’s so sweet of your mom. My mom’s first reaction when I’m sick is to cook me something too :) Happy 2012 to you, my dear. Judy – you’re very welcome! Manda – it totally makes me feel better when I’m feeling lousy. Nicola – yes, you can make it with brown rice. I think you just cook it longer (or to your liking). I’ve seen some made wiht multiple grains and such too. Nancy – not a Momofuku ramen, although I really want to try their broth recipe :) I get my noodles from the Asian grocer in Boulder (dried) or fresh from POM in Broomfield or HMart in Aurora. Chris – mmm, fried minced garlic sounds awesome! Jessica – ha ha, well, it’s ginger, but still just as good! Seriously nothing better than ramen after skiing, except maybe an onsen. That congee looks fantastic, I’ve never been tempted to try it at yum cha but your recipe looks amazing. I love dishes with condiments that you add in at the end, I can’t pinpoint exactly why but I just love it. Yum, I love xi fan! When I went back to Taiwan my grandpa (ah gong) made it for breakfast. After moving to the US mom just bought kids cereals, so I was pretty excited. So I asked him to cook it every day I was there and he laughed because he cooked it every day ANYWAY. I like mine with yu song, chili bamboo, boiled peanuts, fried egg, sometimes kim chi. Your recipe looks delicious! I am determined to make congee. I am Chinese who grew up in Indonesia, many years ago (I now live in Canton (from the same name in China), MI). As many Indonesian Chinese, we were very traditional in many ways (specifically the Hakka way). Your story recipe on rice porridge is very entertaining and reminds me very much of my own experience growing up in Indonesia. 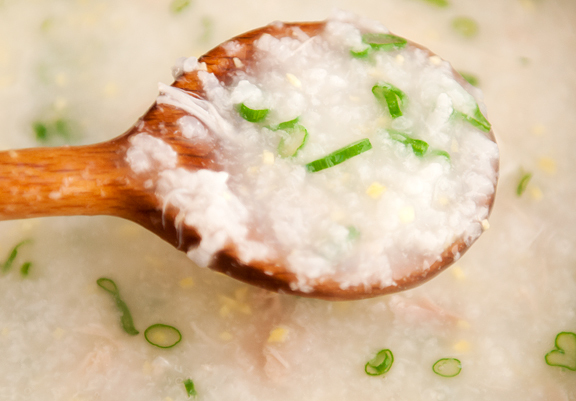 The rice porridge is such a basic soul food for the Chinese and you have depicted it in such a delightful way. If you offer to ship it overnight I would order one right away! Great photography! The dimsum place where I usually have this also adds some of the “1000 year old eggs” but they skip the chinese doughnut which I love. Thank you for sharing this. I really enjoy your blog! 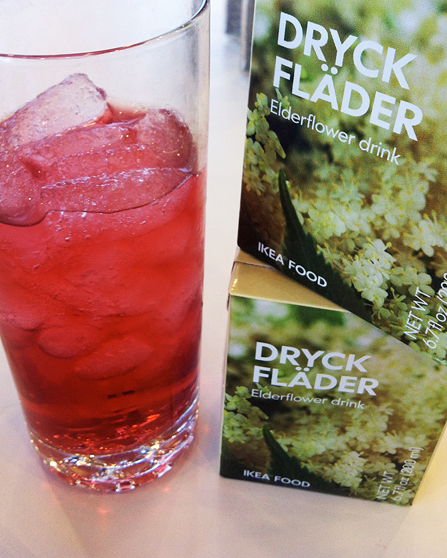 Thank you so much for your clear, easy to follow recipe with pictures step-by-step. I’ve heard of congee for a long time and wanted to try it (especially as my acupuncturist has been recommending I eat it for my condition), but it always sounded like such a monumental undertaking. Your recipe showed how wrong I was! I’m looking forward to the batch that is cooking right now as I write this. Thank you so much for this well laid out and clear recipe and for sharing your family recipe and tips from mom and dad. As one other reader indicated, Kanji (same as congee but the gee is pronounced softer and nasally) is consumed predominantly in the Southern state of Kerala in India. The rice used is actually a reddish starchy rice that is husked and broken into pieces (podi-ari). It is the ultimate peasant style food/comfort food and the ancient prescription for convalescents and the elderly with weakening digestive systems. I grew up watching my mother and grandmothers consume this during the cooler months or the monsoon season. I hated it then but love it now.We don’t consume meat or fish with it as it is meant to provide a clean/cool healing effect to the intestines. The usual accompaniments are spicy pickled lemon/lime/mango pieces, or whole mung beans cooked with coconut. shown on the congee page it looks quite interesting. Great pictures by the way. Read about your dog my black lab is the same when she wants attention you can’t get anything done especially typing. Keep up the great and meaningful work! Solomon – thank you. I don’t really have a recipe for ramen. I make soy sauce chicken here: http://userealbutter.com/2007/11/13/chinese-soy-sauce-chicken-recipe/ and then buy plain ramen noodles dried from the Asian grocery store and load the bowl with sautéed vegetables and goodies like an egg and maybe some chicken or char siu pork. I love this recipe. The addition of ginger is perfect. It’s the ultimate comfort food. I cook lots of Chinese food and always cook this when I’m ill, which I am right now. I’m not Chinese, but I speak Mandarin and lived in mainland China for 4 years. I miss the food so much!